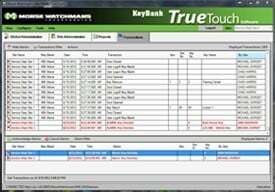 Our TrueTouch client software and the KeyWatcher Touch server application work together to provide a powerful interface that allows easy administration and control of your locker system, and instant up to date reports. The SmartKey locker client interface is designed to allow programming, and reports to be run on all SmartKey locker systems. Add users from a global list and all specific settings (added or modified) will be automatically synchronized across the system. Profiles can be assigned for improved user control. administrative access levels are designed to allow reports only or alarms only in addition to the five system administration levels. TrueTouch reports are generated in landscape or portrait format automatically for the best fit, with color inter-spaced lines for easy reading. Report setups can be saved and then scheduled to run automatically – choose to save them to a specified folder, and/or be emailed! The TrueTouch Server Software is designed for installation on a dedicated computer or virtual machine. The server application is the main interface for the client software and performs all synchronizations or programming and transactions as well as maintaining the SQL database. Access control systems and custom client software also interface with the server application via our available API and integration modules. It’s all done with the express intent of addressing your specific security needs with the most cost-effective, end-to-end solutions.